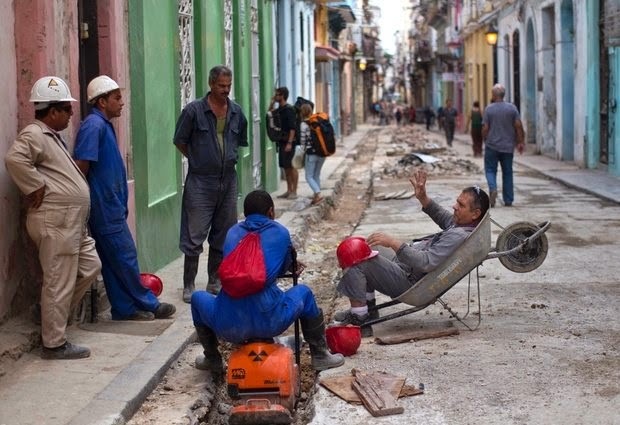 Construction workers speculate what Cuba's President Raul Castro will announce in an upcoming live, nationally broadcast speech in Havana, Cuba, Wednesday, Dec. 17, 2014. Castro spoke about the country's restoration of relations with the United States, saying that profound differences remain between Cuba and the U.S. in areas such as human rights, foreign policy and questions of sovereignty, but that the countries have to learn to live with their differences "in a civilized manner." HAVANA, CUBA (ASSOCIATED PRESS) — Cubans cheered the surprise announcement that their country will restore relations with the United States, hopeful they'll soon see expanded trade and new economic vibrancy even though the 53-year-old economic embargo remains in place for the time being. "This opens a better future for us," said Milagros Diaz, 34. "We have really needed something like this because the situation has been bad and the people very discouraged." Bells tolled in celebration and teachers halted lessons midday as President Raul Castro told his country Wednesday that Cuba would renew relations with Washington after more than a half-century of hostility. Wearing his military uniform with its five-star insignia, the 83-year-old leader said the two countries would work to resolve their differences "without renouncing a single one of our principles." Havana residents gathered around television sets in homes, schools and businesses to hear the historic national broadcast, which coincided with a statement by U.S. President Barack Obama in Washington. Uniformed schoolchildren burst into applause at the news. At the University of San Geronimo in the capital's historic center, the announcement drew ringing from the bell tower. Throughout the capital, there was a sense of euphoria as word spread. "For the Cuban people, I think this is like a shot of oxygen, a wish-come-true, because with this, we have overcome our differences," said Carlos Gonzalez, a 32-year-old IT specialist. "It is an advance that will open the road to a better future for the two countries." Fidel and Raul Castro led the 1959 rebellion that toppled the dictatorship of Fulgencio Batista. The U.S. initially recognized the new government but broke relations in 1961 after Cuba veered sharply to the left and nationalized U.S.-owned businesses. As Cuba turned toward the Soviet Union, the U.S. imposed a trade embargo in 1962. Particularly since the collapse of the USSR in 1991, Cubans have confronted severe shortages of oil, food and consumer goods, forcing them to ration everything from beans to powdered milk. The Cuban government blames most of its economic travails on the embargo, while Washington has traditionally blamed Cuba's Communist economic policies. In his address, Castro called on Washington to end its trade embargo which, he said, "has caused enormous human and economic damage." Ramon Roman, 62, said he hoped to see Cuba welcome more tourists. "It would be a tremendous economic injection, both in terms of money and in new energy and would be a boost for average people who need it," he said. Victoria Serrano, a lab worker, said she hoped to see an influx of new goods because life in Cuba has been "really very difficult." "In particular," she said, "I hope we'll see an improvement in food — that there is trade in this with the United States, which is so close. Right now, even an onion has become a luxury." Around the cathedral in Old Havana, people gathered in doorways and on sidewalks, gesturing excitedly as they discussed the news. Guillermo Delgado, a 72-year-old retiree, welcomed the announcement as "a victory for Cuba because it was achieved without conceding basic principles." Yoani Sanchez, a renowned Cuban blogger critical of the government, noted the development came with a price. Castro, she said, could now claim a triumph and that he had made a "bargaining chip" of Alan Gross, the U.S. aid worker who was released from prison Wednesday while the U.S. freed three Cubans held as spies. "In this way, the Castro regime has managed to get its way," she wrote in a blog post. "It has managed to exchange a peaceful man, embarked on the humanitarian adventure of providing Internet connectivity to a group of Cubans, for intelligence agents that caused significant damage and sorrow with their actions." Some dissidents expressed their displeasure at not being consulted by the U.S. government about the historic move. Dissident Guillermo Farinas considered the move a "betrayal" by Obama who, he said, had promised that they would be consulted. Another activist, Antonio Rodiles, said the measure "sends a bad message." Others, meanwhile, were cautious, saying they'll wait and see what it all means. "It's not enough since it doesn't lift the blockade," said Pedro Duran, 28. "We'll see if it's true, if it's not like everything here: one step forward and three steps back. For now, I don't think there will be any immediate improvement after we've been living like this for 50 years."